Interesting, strong, bold, beautiful! Fresh seasonal natives, wildflowers and foliage arranged by our florists in a crisp white box and smart grosgrain ribbon - wonderfully long lasting and perfect for any occasion. 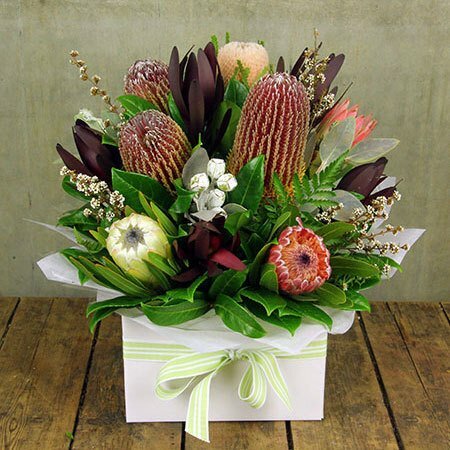 Order this classic gift box of native flowers online, email us at sales@flowersforeveryone.com.au or call the team on 1800 66 66 46. *Please note: The pictured native flower arrangement and special price is exclusive to Brisbane, Sydney Metro, Darwin & Perth deliveries. For a native flower box delivered outside these locations, we recommend calling our consultants on 1800 66 66 46 or emailing directly to sales@flowersforeveryone.com.au . Our team can provide a quote based on the location you wish to deliver to, and place an order on your behalf via our affiliate florist network. 2016-11-24 The person I spoke to was very very helpful. The flowers were delivered and the recipient said they were lovely. 2016-11-06 Service rating : Delivered on time. Delivery cost was reasonable, and discount for being a repeat customer was unexpected but welcome. Product : Seemed good value compared to others. 2016-09-21 Service rating : Ease of ordering and flowers were delivered on the date requested. Product : My Dad said the flowers were lovely.